1More just threw a triple driver at a ridiculously competitive price on the market. A triple driver for only a hundred bucks is unheard of. But it gets better. Not only is it a multi-driver design, but a well-tuned hybrid linking a dynamic driver with two balanced armature receivers! But hold on tight, it gets even better. At first glance the E1001 triple-driver has a wonderful high quality build. Attention to detail also shows in the high quality packaging. First impressions had me quite surprised. If I had noticed any harsh sibilance, I would have guessed this earphone is Audio Technica’s new reference IEM. Ignoring my cynical remark, it is simple wowing what is offered here at a budget price. 1More might be a lesser-known name, but their products surely aren’t. The Xiaomi Pistons were a small budget sensation a few years back and I couldn’t withstand the bang-for-buck either. I bought the 2nd version and it had a firm spot in my jacket pocket. Based on this, I figured 1More’s triple-driver is definitely worth looking into with more focus. First impressions are important. And if you don’t know what to expect, a nice package can make all the difference. Unpacking the E1001 is almost as much fun as with any high-end universal out there. This time, 1More went a step further and absolutely managed to blow the roof off my expectations’ house. The heavy cardboard box oozes quality and nicely stores the many accessories. 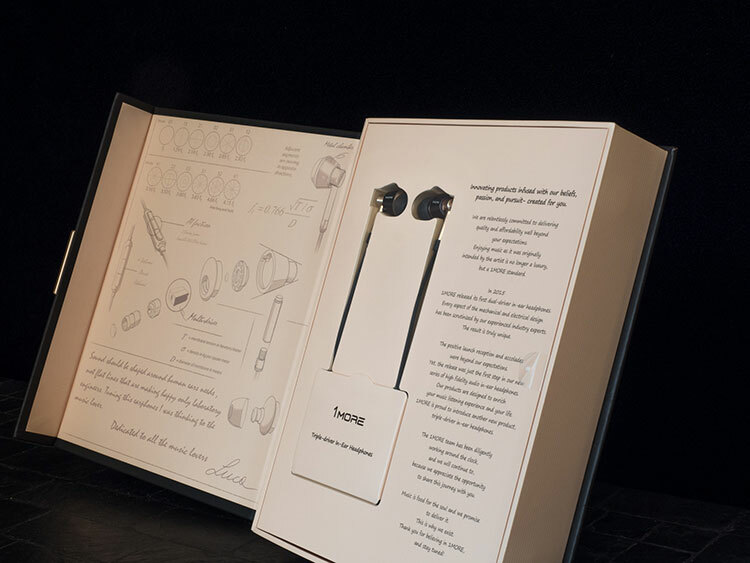 The earphones are displayed nicely once the box folds open. It feels like opening a book. The inside of the packaging is reminiscent of Renaissance-era literature. I do have to admit that the style is not absolutely fitting to the product because I fail to see the connection. Neither is 1More a traditional company, nor are they Italian or French, nor is the product old-fashioned. 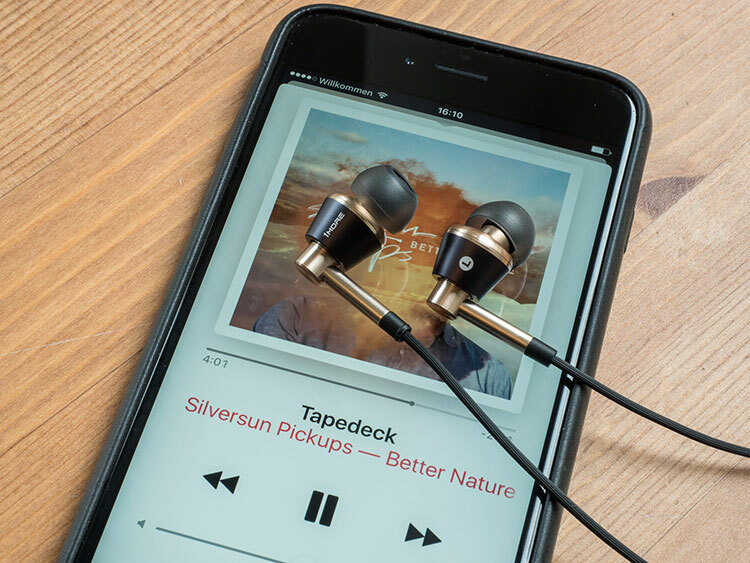 On the contrary, hybrid in-ear designs are very modern and are just now slowly finding general acceptance. Most probably 1More wanted to emphasize the cooperation with Italian sound engineer Luca Bignardi thus the package design reminds me of technical drawings by Leonardo da Vinci. Whatever, the overall package just feels nice to hold, open and look at. There is definitely some premium feeling achieved here. Another thing that irks me a bit is the Hi-Res Audio sticker on the front of the box. It looks like some official seal but in the end the earphone cannot do what others don’t. Even more so, the term high resolution audio was picked up by marketing to sell higher bitrate audio. My guess is, the sticker is supposed to emphasize the frequency range that officially goes up to 40 kHz. However, I hope all readers never trust these official specs. Not to mention, even if it were possible, it would still be inaudible. Storage case, earphone tips, airplane adapter and cable clip are all boxed separately in the original packaging. That is not only an ample accessory set but the amount of included ear tips deserves a separate mention. Silicone tips come in 6 pairs of different sizes. It is practically impossible to not find the perfect size. Something around 12.5mm diameters come pre-installed. Additionally, you will find 10, 11, 12, 13 and 14.5mm sized tips. On top of that, 1More included 3 sets of foam tips (S, M, L). The foamies aren’t from Comply but of a tighter and thicker kind. Personally, I preferred the silicone tips (size 13mm if you really want to know) as the foam tips sounded too warm and thick in the bass. Also, I like the storage case a lot. It has a faux leather design with a soft fabric on the inside. Size is equal to that of a pack of cigarettes (I have to guess as I don’t smoke) and it closes via a magnet. The edges feel very durable, even though I only expect a strong cardboard underneath. It is simple as it is genius and it looks very premium as well. Build quality is nothing short of fantastic. The E1001 features a mostly metal build with some parts made of plastic. The plastic is a very very dark blue or grey, depending on the light. The metal part is colored slightly golden which further adds to the premium finish. I thought I remembered that 1More offered different colors at first, at the very least with a silver metal instead of gold, but at the time of this review I cannot find any other colors for purchase. I cannot promise that everybody can dig the bling bling design. Wearing the E1001 does remind me of wearing earrings – something I have never done before, but after seeing how nice these IEMs look in my ears, I might consider. I also have to note that even though I used these a lot and the two sides of the earphones occasionally bumped into each other, there is still no wear and tear visible as of yet. 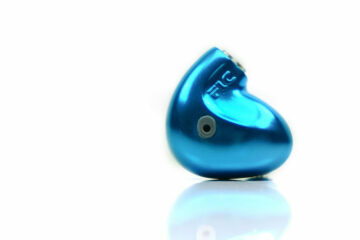 The housing resembles the form of an earbud that kind of hangs itself into the antitragus. But it extends into a nozzle with replaceable ear tips that go into the inner ear canal and isolate like other in-ear monitors. The metal construction does add some weight to the earphone but because of the design it feels lightweight nonetheless. This allows the body a bigger size without hurting comfort. A size that overall is still moderate considering it not only houses a dynamic driver but two further drivers. The finish and nice choice of materials put the 1More triple-driver all the way up among some of the nicest earphones. Earlier I referenced to Audio-Technica as the E1001 immediately reminded me of the CKM1000, but on closer inspection I had to conclude that the Japanese do have a little bit more impressive design and build, especially for the wood designs. However, 1More is not that far behind and I cannot wait to see what would happen if the company decided to tackle the high-end market. I found two venting ports on the shell. One tiny hole on the front that is partly hidden under the ear tips and a bigger slot on the back. These are needed for the dynamic driver to push air but as a negative they hurt the isolation. Even when the ear tips fully seal the ear canal, surrounding noises come through to a mild extent. It’s not an earphone that I would recommend in loud environments but even more so in areas that require some awareness of the surrounding. As for comfort, I have no complaints either. I feared the design would cause some limitations due to the big middle part of the housing, but I reached the earphone around to many friends and none had any problems. The E1001 cannot be inserted too deeply into the ear canal as the big body will block it, but this is not necessarily a negative if the sound design was aimed for a shallow fit. The back part does reach out of the ear a bit, so you cannot use these for sleeping on the sides. The cable can be worn over the ears too. But since the nozzle is angled, the sides have to be switched. It didn’t result in a much deeper insertion either, so I don’t recommend to do this. I must say that overall the 1More E1001 is a very comfortable in-ear to wear. I like how the weight simply disappears as the earphones lie on the antitragus. In winter, the metal parts can get cold. Something you might have to get used to if you don’t often wear in-ears. The cable of the E1001 is black in color and equipped with full 3-button controls and mic for Apple devices. Depending on your manufacturer’s TRRS pin-layout, this might be fully compatible with Android devices too. I only tested the mic for short, but it did work really well. 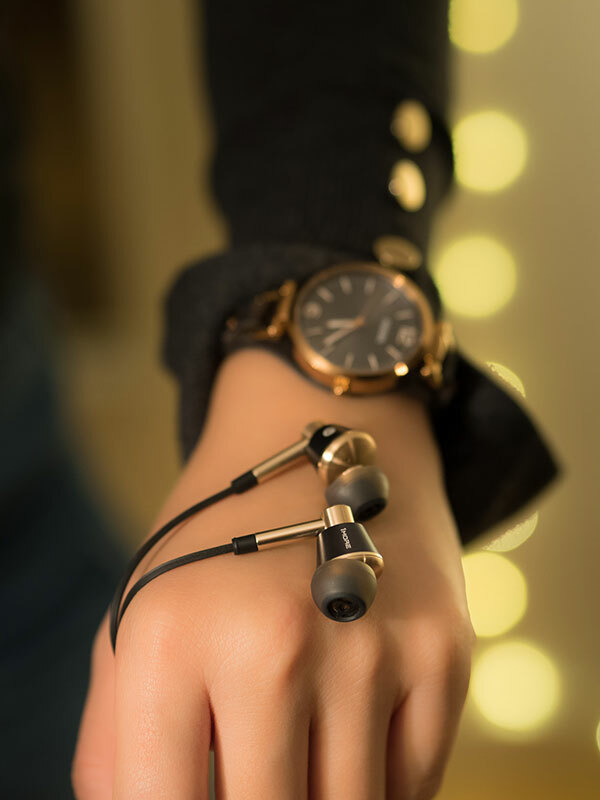 The buttons are made from metal, perfectly matching the earphones design. The middle button has pronounced edges. The shell in which the buttons are put into is plastic. This makes it really easy to map the buttons without looking and to quickly forward a track or to decrease volume. Y-split and termination are made from metal too. The rubber cable is rather thin with somewhat strong memory. Even after prolonged use, it would not fully straighten itself. Above the Y-split the cable is very prone to microphonics. Below the Y-split the cable has an added layer of plaited cloth which completely annihilates the annoying microphonics. I would have liked to see it extend all the way to the earphones but even the lower part will help enough. The cable measures around 1.2m and might be a bit too short for some desktop users but feels just right for any DAP that finds its way into either pants’ pocket. I do not count it as a negative that the cable is not user-replaceable. It should not break easily as according to 1More it is Kevlar-strengthened. Your review of these is spot on.. The most objective I’ve read so far. Yes, better sources or daps won’t change its (for me) lack of resolution and dynamics. I’ve had mine for a few months but soon gave ’em to my sister who now happily uses ’em with her old iPod. Please note I mean the new Hybrid PRO, not the Xiaomi Hybrid (which turns out to be exactly the same sound design as the 1More Dual-Driver EO323). Thanks, Klaus.. I’ll check out the Xiaomi Hybrid Pro. I actually have a budget of ~$300, so I have a few more options. I liked the Oriveti Primacy I got to try, BUT only with silver litz braid cables. With the stock cables they were good but still lacking to my taste. At least they are easy to drive and not sibilant.. I might get the Primacy and upgrade the cables later… I’m still ‘shopping’ around.